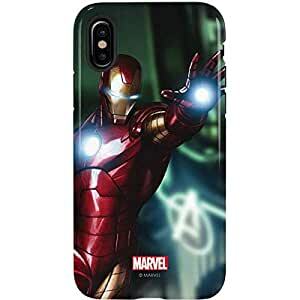 The Marvel Ironman iPhone X Pro Case combines a dual-layer case protection for any Apple iPhone X. Featuring a shock-absorbing soft touch interior and a durable hard-shell exterior featuring a bold Watch out for Ironman graphic. Each Skinit Pro Ironman phone case uses 3D print technology for rich and vibrant colors. As a final protective layer, the Marvel Ironman iPhone X Pro Case – Watch out for Ironman is sealed with a durable scratch and scuff resistant high gloss coating that is built to last everyday wear and tear. Buy the official Watch out for Ironman Pro Case by Skinit for your Apple iPhone X today and make it yours!